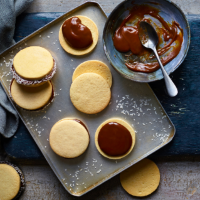 These South American-style cookies are usually sandwiched with dulce de leche, but a homemade muscovado caramel makes a brilliant alternative. 1. Start by making the caramel fi lling. Put the butter, sugars and golden syrup in a large saucepan and melt together over a low heat, until smooth. Bring to a simmer, then add the cream in a slow trickle, stirring with a long-handled wooden spoon in case it spits a little. When the caramel reaches a full boil (it will climb up the pan and look frothy), cook for exactly 4 minutes, stirring often. Stir in a pinch of salt, then pour into a large heatproof bowl, cover the surface with lightly oiled cling fi lm and set aside for 2½ hours or until just warm. Avoid stirring as it will make it granular. 2. Meanwhile, make the biscuits. Using a wooden spoon, beat the butter and sugar together until pale, then beat in the egg, yolk, vanilla and salt. Sift in the flours, then mix to a soft dough. Divide between 2 pieces of cling film, shape into saucer-sized discs, then wrap and chill for 20 minutes, until fi rm. 3. Preheat the oven to 190˚C, gas mark 5; line 2 baking sheets with baking parchment. Lightly flour a work surface, then roll the dough out to about 0.5cm thick. Stamp out biscuits using a 6cm cutter and re-roll any trimmings to make about 36 biscuits in all. Bake for 10-12 minutes, in batches, until pale gold and sandy to the touch. Cool for 5 minutes, then transfer to a wire rack to cool completely. 4. When the caramel is very thick and warm to the touch, use it to sandwich the biscuits together. Roll the edges in the coconut, if using, before serving.